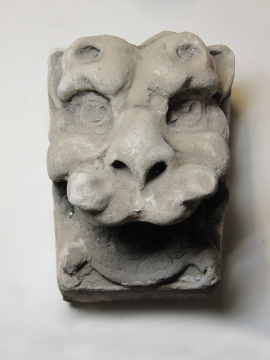 This monstrous, gargoyle-like, head (?lion) was in Soane's Museum by 1825 when it appears in a watercolour of the Monk's Yard. It is not quite clear where it was at the time of Soane's death although it was certainly allocated the number MC8 by 1906 (Spiers inventory) when it was out in the New Court in an arrangement against the west wall created by James Wild. Spiers' entry for it reads 'Grotesque Gothic head - Stone'. The original entry for MC8 in the AB inventory of 1837 reads '[MC] 8 Fragment of a grotesque Gothic head - Stone'. However, there is a marginal note that 'The following fragments being in a state of rapid decomposition were put into the Museum 1839 viz:- [list of object numbers including] ... 8,...'.